In a press release it issued on January 30, 2012, the Executive Office of the Eritrean National Council for Democratic Change confirms that “the legitimate patriarch of the Orthodox Church of Eritrea” is sick and in worrisome condition. The patriarch is 85-years old. The press release also called on the entire Eritrean people, Christians and Muslims alike, to condemn the heinous action of the government in unison. 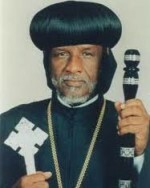 In January 2006, the Eritrean regime practically removed Abune Antonios, and limited his movement and in May 2007, the regime installed Bishop Deskerious in his place. For almost five-years now, Abune Antonious has been under house arrest. Eritreans in general and particularly Tewahdo Christians have condemned the intrusion of the state in Church affairs. will pay the price, GOD is watching and will do them harm his own way. May Allah give them strength, health and his blessing. This is how we want to remember our leaders. His holiness stands his ground for the truth and fairness in the land run by evil. They wish to let let him out if he bows and be a yes man, but a man with such pride will never let a tyranny play in his field, he rather stay where he is and face his lord with a clean record. There is always a price to pay, and it is worthy . No need to cry for his holiness, he knew the consequence. we have to encourage our leaders to fallow his model (die with respect and leave behind a good legacy). We need more of such leaders who are faithful to our cause. May allah give him the energy to bare this hardship. What is happening in Eritrea reminds me of what is written in 2 Chronicles 26:16-21. I pray that all the faithful take courage from these versus and stand up for the holy Church. 21 King Uzziah had leprosy until the day he died. He lived in a separate house[d]—leprous, and banned from the temple of the LORD. i am calling for the immediate release of Abune Antonios. His holiness stand for the right and truth amidst of tyranny and betrayal. He stands up in his word and his stand made Issias little. We have to learn a lot from this spiritual leader , he does not afraid the world leader rather he stands for the truth. DIA tries to undermine his holiness by dethroning , isolating, and detaining himself with out proper health care but he stands in his position with out comprising his integrity. Even after he dethrones he is still recognize as the Patriarch of the Church not only nationally but internationally. Amidst of his fragile health condition , old age, isolation and devotion of medical care he survives the last five years and this will worry the regime too much . It is time that Issias and others Bishops who betray the Patriarch will pay for their crime against him.He is like a good shepherd who gave himself before his congregation and stands for the cannon of his church. It is time other religious leaders, elders and tribal leaders follow his foot to stand for truth and human right of their people. He is the man that embarassed teh president by telling him not to interfer with church matter and deal with its congregation by the rule of the church and asked him to release the imprisoned priests of the Orthodox church. I am calling from the holy city of Makkah for the immediate release of Abune Antonios. Be merciful to his holiness as he does not bear hardship and stress any more.